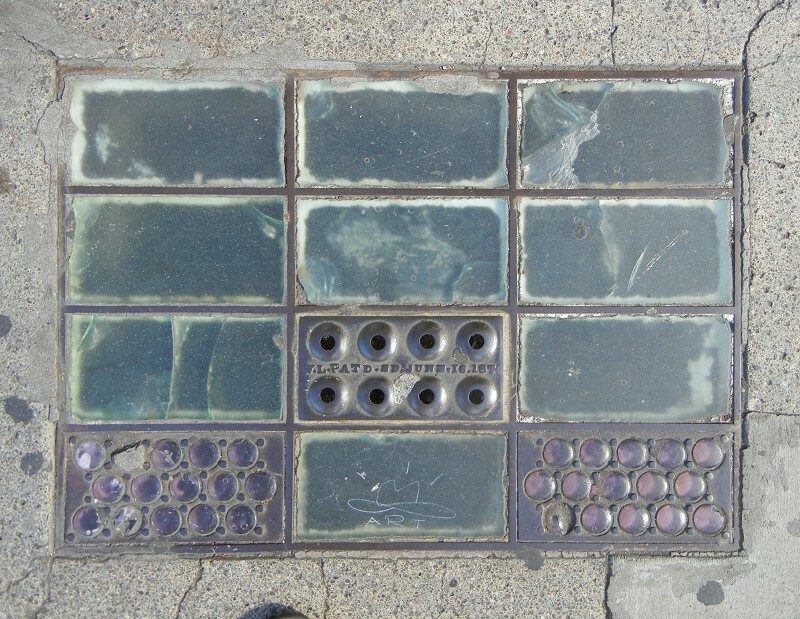 Oakland’s older districts feature remnants of pre-electric technology known as vault lights. 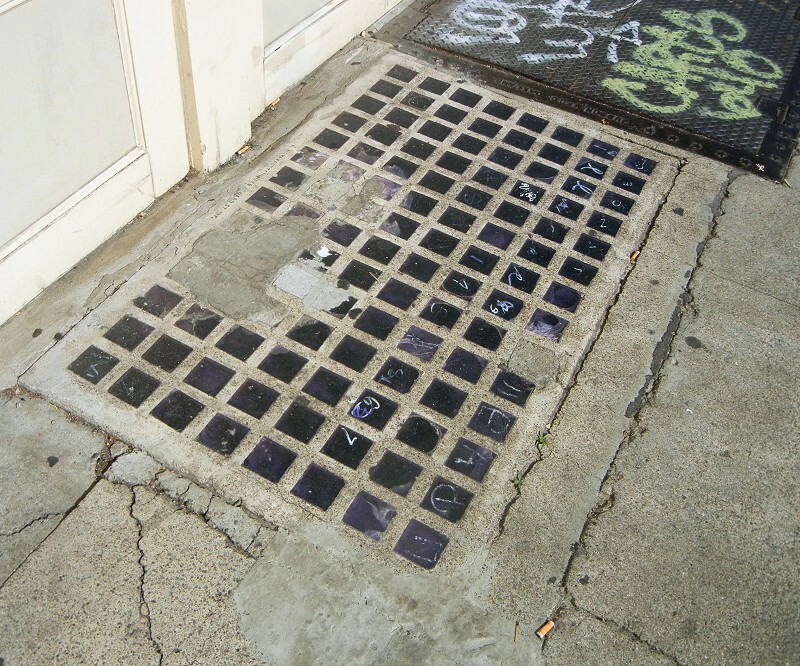 They were invented around 1850 as a way to bring daylight into vaults, or basements that extend beneath the sidewalk, by means of thick glass disks mounted in cast-iron frames. 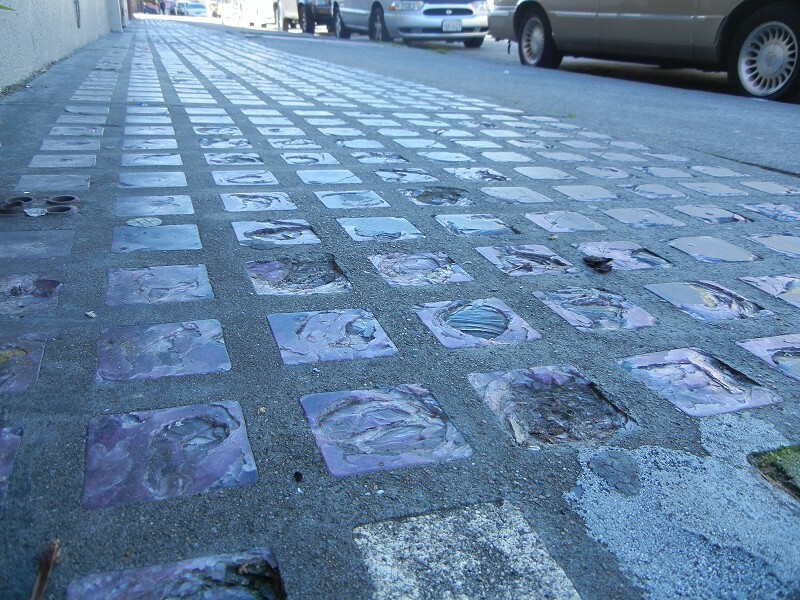 In the late 1800s, with the spread of reliable Portland cement, reinforced concrete replaced cast iron. Oakland has examples of both types. The photo above shows what’s probably Oakland’s largest continuous set of vault lights, in front of the Jefferson Court apartment building at 581 18th Street. It goes all the way to Jefferson Street, about 120 feet. Each piece of glass is actually a block with a prism on the bottom, which bounces and spreads the light sideways into the underlying space. See a quick introduction at glassian.org. Here’s the only example I’ve found of a cast-iron vault light, on Telegraph near 19th Street. The ventilating panel reads, “W.L.PATD.SF.JUNE,16.1874”. The clear glass may be a later replacement of the round glass prisms. The Haley Law Office building at San Pablo and 16th has a fine set of vault lights. I’ve walked past at night and seen the cellar lights shining up through them. The Carles Apartments building, on Jefferson at 10th, has handsome vault lights along its whole frontage. I don’t know the manufacturer. So, are these old features hopelessly ruined? Not at all! 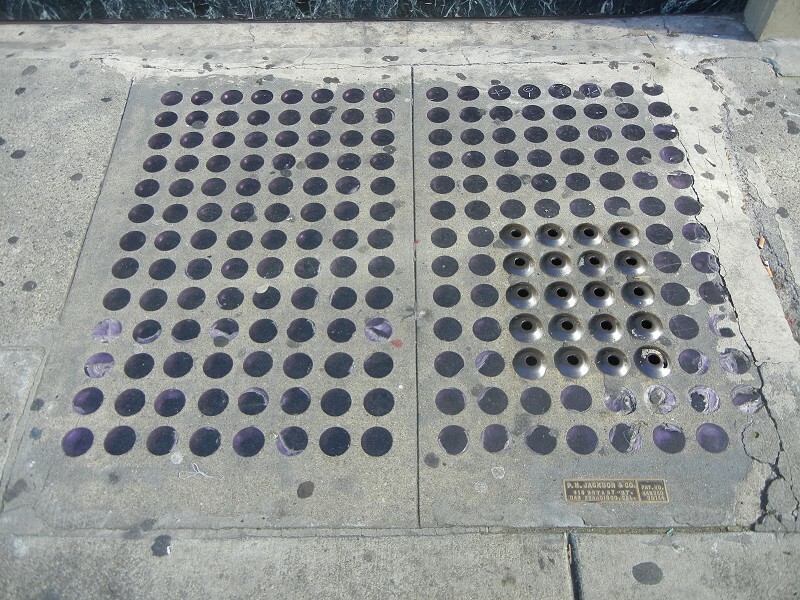 The National Park Service has a nice restoration case study from New York City, where 19th-century street tech is still abundant. 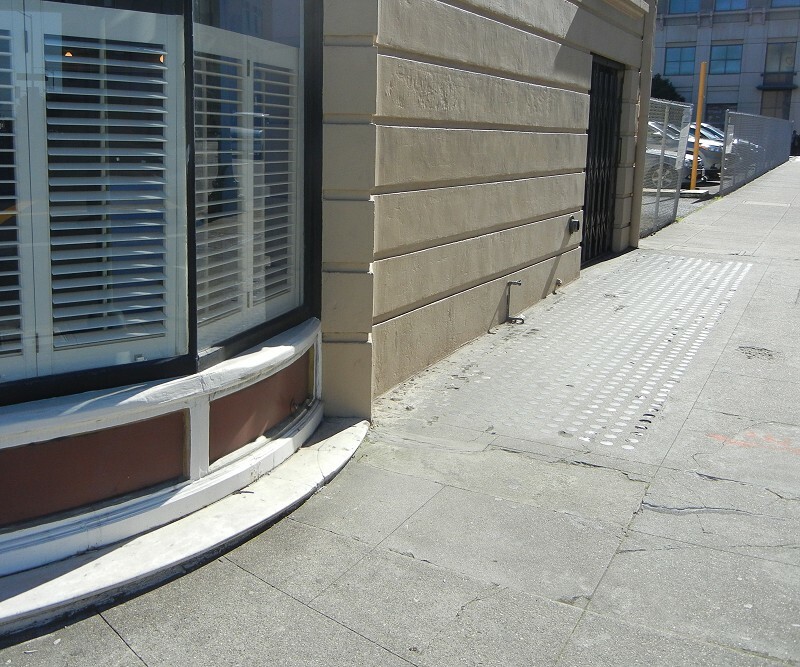 This entry was posted on 11 March 2016 at 8:03 am and is filed under Streetscape. You can follow any responses to this entry through the RSS 2.0 feed. You can skip to the end and leave a response. Pinging is currently not allowed. 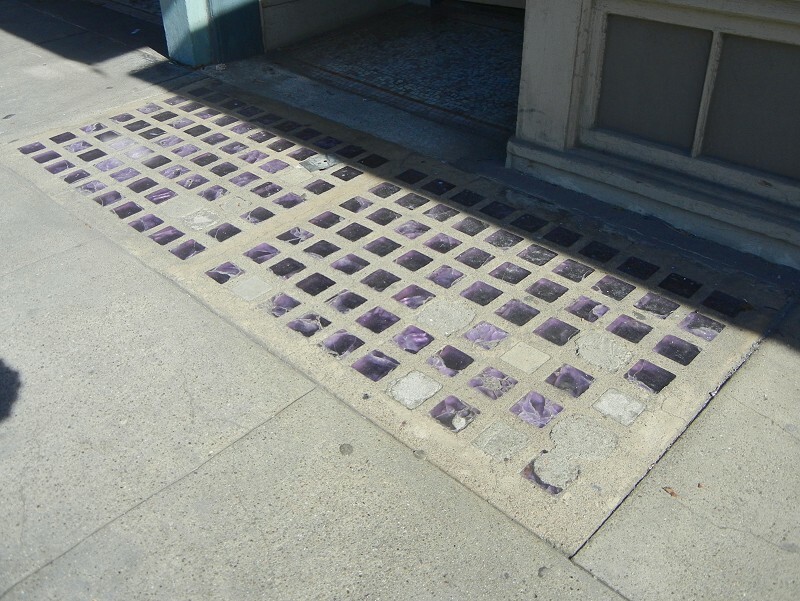 On an OHA walk a couple of years ago, the guide said the purpled glass was pre-WWI from Germany. With the outbreak of the war, the supply was cut off. Obviously some may have been already in the production stream and installed later, but pre-WWI is a good general guess for the age of any of the purpled glass.